"I hang around with all kinds of young people and I have a lot of Muslim friends," Malakon tells CNN after finishing the noon prayer on a Monday. About 20 people were in attendance, usually from local businesses around the synagogue. None of them tried to hide the fact that they were Jewish -- and inside the synagogue the Star of David is proudly displayed in many places, alongside passages from the Torah. "Israel and Iran are countries," he said. "And we consider ourselves Iranian Jews, not Israeli Jews. So the hostilities between Israel and Iran do not affect us." There is even a Jewish representative in Iran's parliament. And aside from the vibrant Jewish community in Esfahan -- there are 13 synagogues in the city -- there are also several Orthodox Cathedrals representing a sizable Christian community. Most of Esfahan's Jews are business people. In the center of town there is a shopping mall, known to people here as the "Jewish Passage" because so many businesses are Jewish-owned. When our crew arrived there they found Muslim and Jewish shop owners joking around. One of them is Said Shemyon, who owns a clothing store. His friends call him "Mordechai," and he showed us some Hebrew prayer books he always keeps in the store. Like most others, Shemyon was not keen to talk about Israeli Prime Minister Benjamin Netanyahu's recent address to U.S. Congress, or the problems between Israel and Iran. He says those politics have no place here. We really hope that all these problems can be solved one day, God willing. We are just hoping for unity and peace. "We just want peace," he said. "We really hope that all these problems can be solved one day, God willing. We are just hoping for unity and peace." 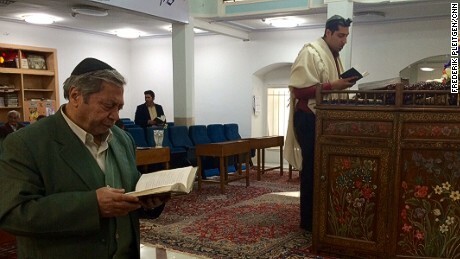 There are about 1,500 Jews in Esfahan these days. The community's leaders conduct religious studies for the younger members of the congregation. While Sion Mahgrefte is adamant that they have no problems with their Shia neighbors, he does acknowledge that friends living abroad often worry about them. "Of course sometimes people we know who live in Israel or elsewhere are very concerned about us, and they tell us we are crazy to live here," he says. "But then we tell them how things are and they calm down."